Although the literary foundation of Western philosophy, Plato today is almost a legendary figure, his very name sparking the image of higher learning, truth, and perspicuity. How ironic then that in a mosaic of Plato’s Academy, the biggest quandary might be which figure is Plato. The mosaic was constructed sometime between the 1st centuries BCE and CE, in the villa of T. Siminius Stephanus in Pompeii. Athens is visible in the upper right background, as well as what might be the Dipylon Gate with its bronze amphorae on top, which was not far from the academy. There is a sundial on a column, possibly representing philosophical views on time and transience. The border depicts elaborate festoons of leaves, fruits, and theatrical masks of fantastic creatures, as was common during this time period. Roman actors used megaphonic masks to amplify their voices; perhaps the artist added them to stress that the Academy’s wisdom should be heard. They could also be an allusion to the works of Plato, Aristotle, and Theophrastus, as they frequently discuss art and drama along with philosophy. The mosaic features seven men: six students and, presumably, their teacher, Plato. All the figures are deep in contemplation or discussion. Unfortunately, unlike medieval religious art, there is no halo or other compelling iconography to distinguish the hero from his students. Each figure is a viable candidate, with thoughtful expressions and pensive gestures. However, most scholars agree that the third man from the left, directly beneath the tree, is Plato. His position in the scene is telling: roughly in the center of the gathering, and nearest to the center of the mosaic. His robes are darker and more somber than the others’, immediately drawing the eye. While the others are merely contemplative, Plato seems to be speaking, perhaps lecturing. He is aligned perfectly with the tree (a sacred olive full of fruit, associated with the goddess of wisdom, Athena), so that it almost appears the tree is growing from him. Perhaps this was intentionally symbolic on the part of the artist: Plato is the root of knowledge, the foundation of the academy. Moreover, the dark tree, contrasted with the light background, directs the eye to this figure. This central man, most likely Plato, seems to be pointing at something with a stick. The traditional interpretations believe he is gesturing at the globe seen in the foreground. However, I believe it is also possible that he is pointing at a dark shadow on the ground. If this is true, this would make an even more compelling argument that the man in black is in fact Plato, since it may be a reference to his famous Allegory of the Cave, and his discussion of shadows versus reality. The shadow is depicted in exceptionally dark colors, leading some scholars (such as Carol Mattusch) to take it for a sandal, while an article from the Museo Archeologico Nazionale di Napoli states it is a geometrical figure Plato is drawing. However, a closer examination shows it more closely resembles a very dark shadow, since it is darker in the middle and follows the edge of Plato’s foot. If indeed it is a shadow, the artist used much darker tesserae than for the other shadows the men cast. The pale tiles that make up the floor further emphasize this: these are lighter than the other shades in the background to create depth perception, but also perhaps to provide contrast for the shadow Plato is pointing at. The result is the eye jumps immediately to the black shape, then follows Plato’s figure up the tree. If this is true, then the artist specifically wanted the viewer to notice the shadow. If the man truly is discussing the shadow and the Allegory of the Cave, then he is almost certainly Plato. Plato’s famous student Aristotle may also make an appearance, though there is less compelling evidence for this. 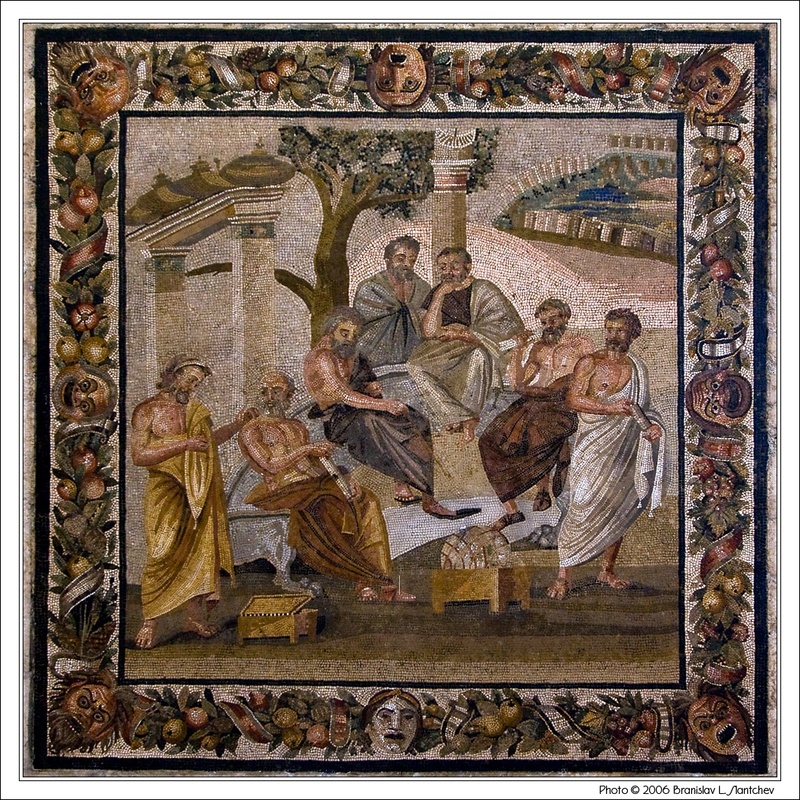 While Plato and the four men to the right make up their own circle, the two men on the left are having their own discussion. The brightly dressed figure to the farthest left, wearing a diadem, may well be Aristotle, who is coming up with his own ideas and discussing them with a fellow student. Only the man in yellow and the man in black are speaking in the mosaic; perhaps they are the only two with something to say. Although even more difficult to discern, another famous student of the Academy, Theophrastus, may be depicted on the farthest right, since the man’s hair appears darker and more youthful than all the others (Theophrastus was roughly thirteen years younger than Aristotle, and fifty-five years younger than Plato). There also appears to be a pile of stones behind the figure; this could possibly be a reference to Theophrastus’s work De Lapidibus (On Stones). The Museo Archeologico Nazionale di Napoli suggests the man to the right of Plato is a visitor because he keeps his hands and arms hidden under his cloak, as a sign of respect. It further surmises the first on the left could be Heraclites Pontico, the second on the left is Lysias, the second on the right is Senocrates, and the man to the very farthest right is Aristotle; however, no explanation is given for why these names are attached, though all were associated with Plato. G.W. Elderkin, in his American Journal of Archaeology article “Two Mosaics Representing the Seven Wise Men”,  notes that while most historians assume the scene to be Plato’s Academy, the seven figures are also a clear reference to the seven wise men – “Seven Sages” – of ancient Greek tradition, whose names are Thales, Pittacus, Bias, Solon, Cleobulus, Myson, and Cheilon. He further notes that the scene resembles the Peripatetic of the Lyceum, with a view of the Athenian acropolis; this location is strongly associated with the Academy. It is quite possible that the mosaic is meant to represent both groups, Plato’s Academy and the Seven Sages of legend. Based on the interpretation that Plato is pointing to the globe,  on the other hand, Mattusch suggests the companions could be some members of a ancient list of a dozen great ancient astronomers, such as Thales, Anaxagoras, Pythagoras, Xenophanes, Democritus, Eudoxus, Euctemon, Callipus, Meto, Philippus, Hipparchus, or Aratus. Mattusch also points out, however, the number of figures could be a connection to the Seven Sages, and further notes that the sages often had fluid identities, so Plato could conceivably be included among them. It seems an interesting comment on life, in an age where we assume we know so much, that we cannot even identify with certainty which man among a group of seven is the brilliant master of philosophy, whom we should surely know by some radiating aura of wisdom, by some physical mark of genius. Or perhaps disguising Plato among his fellows was the artist’s intention; when we gaze at the work, all we know is that we know nothing, not for sure, and perhaps any of us could be the genius. “Academy of Plato.” Museo Archeologico Nazionale di Napoli. Museo Archeologico Nazionale di Napoli. Thematic Image Gallery. G. W. Elderkin. “Two Mosaics Representing the Seven Wise Men.” American Journal of Archaeology. 39.1 (1935): 94-95. Elizabeth Mackey and Rachel Bernstein. “Pompeii and the Roman Villa: Art and Culture around the Bay of Naples.” Los Angeles County Museum of Art. Museum Associates/Los Angeles County Museum of Art, 2009. Academic Essay. Carol Mattusch. Pompeii and the Roman Villa: Art and Culture Around the Bay of Naples. New York: Thames & Hudson Ltd, 2008. 214-15. Thank you for a timely article. I’ve recently been pondering this image and presence of the globe. Plato himself left much unwritten, in the ‘shadows’. Perhaps we’re reminded of Plato’s “Phaedrus” dialogue about leaving the city for a rural setting to talk about philosophical matters. Copyright © 2017 Electrum Magazine. All rights reserved.